Despite the fact that I'm a foodie, I must confess I do not have an iron stomach. In fact, ever since I was in middle school I have always had quite a sensitive gastrointestinal system. New ailments seem to pop up every other year for me. I tried taking a probiotic once, and the instructions on the back said you might feel worse for the first two weeks of taking it, but when two weeks came and went and I still felt terrible, I figured perhaps that was not the best course of action for me. I've tried eating yogurt regularly as well but sometimes that upsets my stomach too. Well one of my new favorite Whole Foods discoveries has been probiotic drinks. I was a bit skeptical at first, but to tell you the truth, I was drawn more to the flavors than the fact that they were labeled probiotic. That's the thing for me: if it doesn't LOOK good, I don't care how good for you it is, I'm probably not going to want to try it. 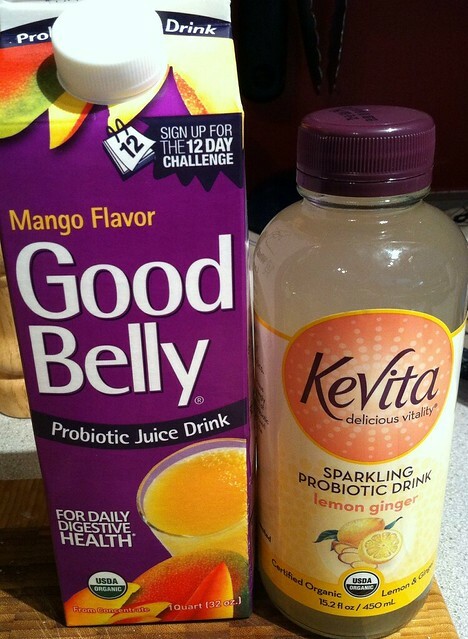 My two favorite brands of probiotic drinks are Good Belly and KeVita. Good Belly is strictly a juice drink and KeVita is a sparkling drink. Both brands have some really great flavors (like mango, pomegranate blackberry, grapefruit, lemon ginger), but my Whole Foods only carries a few of them. I'm hoping they eventually start carrying more. KeVita, while delicious, is on the pricey side (close to $4.00 for a 15 oz bottle), so I only buy a couple at a time, but I especially love the lemon ginger flavor. It's very refreshing and has a nice little kick to it. I have also noticed a small improvement in how my stomach feels since I started on these drinks. Only time will tell if they show any sort of long term effects. But as of right now, the probiotic part is just a bonus. I wouldn't be drinking them if the flavors weren't appealing because to me, that's the most important part. So I will keep drinking them for the yummy flavors, but I will keep my fingers crossed that they will continue to improve my gastrointestinal health. I've seen these in Whole Foods and wondered about them. I hope it continues to work well for you. I have never tried a probiotic drink but both of these look tasty. Hopefully they help you feel better! Oh good to know. I haven't gone for the probiotics but my mom swears by them. "if it doesn't LOOK good, I don't care how good for you it is, I'm probably not going to want to try it." Nice review you have here about Probiotics drinks. Additionally, probiotics can treat common digestive problems, such as diarrhea, bloating and an upset stomach. I used to drink Yakult probiotic milk, I find these products not only delicious but perfect health-emerging & balancing as well!